WARNING! This post contains graphic images of an injury to a skull and brain. Older kids and adults only, please. Phineas Gage and the tamping iron. A while ago, I said that Henry Molaison (a.k.a. HM) was the most famous patient in the history of neuroscience. I think, on reflection, that I was wrong. Since I study learning and memory, HM is more relevant to my work than the man I’m going to talk about today. But if I’m being honest, HM is only the second most famous patient in the history of neuroscience. Phineas Gage is the first. He’s also the first patient. You could argue that the moment that spike went through Phineas Gage’s brain was the moment that neuroscience was born. The first neuroscientist (the man we consider to be the father of neuroscience), Santiago Ramon y Cajal, wasn’t even born until four years after Gage’s accident. In 1848, Gage was a railroad foreman. He was setting up an explosion, using a tamping iron to pound blasting powder into a hole deep in a rock. A tamping iron is a long, metal rod. The iron struck the rock, there was a spark, and the powder exploded. The tamping iron shot through Gage’s cheek, out through the top of his head, and landed on the ground 80 feet (25 meters) away. The first amazing thing about this story is that Gage didn’t die. This was a time before antibiotics were widely used. He not only survived a spike shooting through his brain, but he also survived any infection. Major props to Dr. John Harlow for keeping Gage alive. But it wasn’t until after Gage recovered that things got really amazing. Before the accident, Gage was reliable and intelligent, an energetic worker, and just an all-around good guy. After the accident, he was rude and unreliable. He couldn’t hold down work. He urinated in public. He had a terrible temper. He was a different person than the one he’d been before. Holy cow! Phineas Gage suffered an injury to the brain, and his personality changed completely! How? 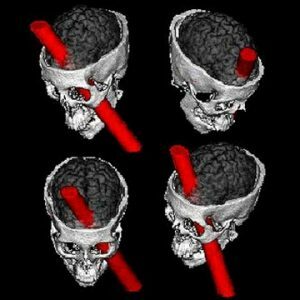 The rod went through an area of Phineas Gage’s frontal lobe called the prefrontal cortex. The prefrontal cortex is what makes humans human. Specifically, Gage lost the sections that are important for decision making, planning for the future, and impulse control and following social rules (i.e. the bits that tell you it isn’t okay to urinate in public or swear at fancy ladies). All the bits of the brain responsible for muscle movement, language, and basic survival were still present. So Phineas Gage survived, and he could still walk and talk, but personality-wise, he was unrecognizable. A digital reconstruction of Phineas Gage's injury. This is just a computerized image, not a real brain! I'm showing you this because I want you to see exactly where in the brain the injury happened. This is from a study done by Hanna and Antonio Damasio. 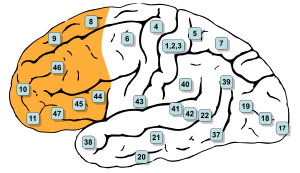 The prefrontal cortex is in yellow. From Wikipedia. This is all super-interesting from a basic neuroscience standpoint, but it’s also super-interesting from another perspective. Something as small as railroad spike changed Phineas Gage from a person of virtue to a person of disgrace. If a brain injury can change our personalities, what does that say about who we are? Are we, in the end, just a product of neurons firing, or is there something more? I know what I think, but it’s up to you to decide what you think. And here are some more questions for all the budding neuroscientists out there. Serious brain injuries happen to people every day, and not all of them can be fixed. 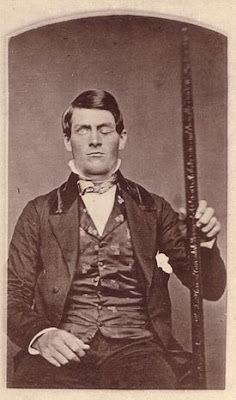 Phineas Gage died over 150 years ago, but knowing what we know now, we still wouldn’t be able to return him to the person he was before the accident. But maybe that's just because we don’t yet know enough. So here are the questions: Is it reversible? And if it is, how? What do we still need to learn? If you decide to be a neuroscientist, you might be the one who figures out how to fix the modern-day Phineas Gages. Why was your comment removed?